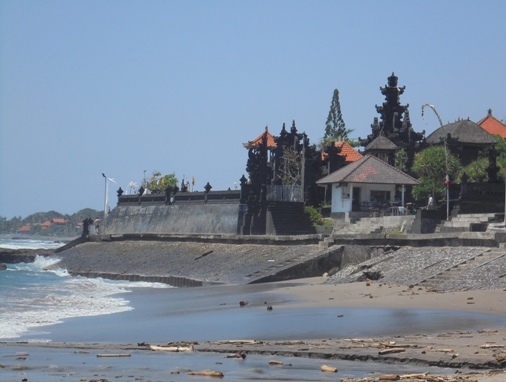 Pura Batu Menjan Canggu - Beautiful Temple and Great Seascape! Pura Batu Mejan Canggu is a beautiful temple, unique, highly respected and hold great spiritual significant. This holy temple perched on a low-laying beach rock and jutted out to sea. Visitors can feel a calm and relaxed atmosphere, while enjoying beautiful panoramas such as Pererenan Beach, Batu Bolong Beach, and even Kuta, Jimbaran and GWK in the distance. 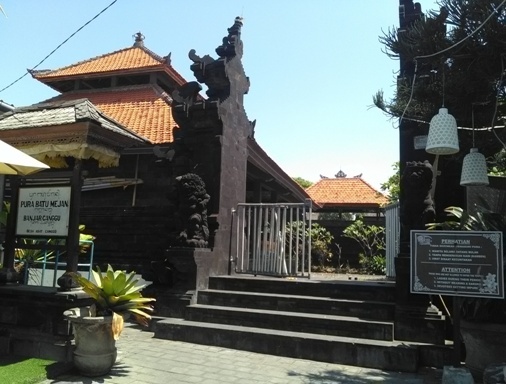 This holy temple is located in Banjar Canggu, Desa Adat Canggu, North Kuta District, Badung Regency, Bali. The temple set amidst a peaceful environment with slower life pace of coastal villages, fresh air and fertile rice fields. 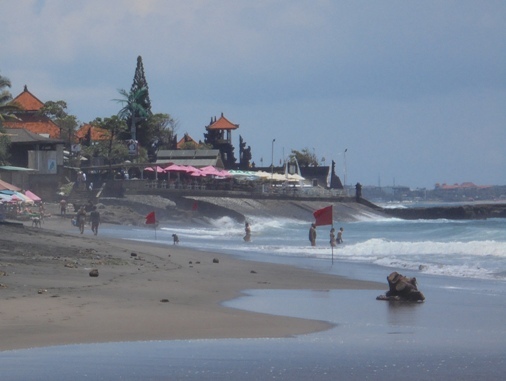 A lovely grayish-black sand stretch in front of the temple, the Batu Mejan Beach (Echo Beach). You can access this temple easily by car. There is parking near the beach. There are also facilities such as food stalls, souvenir booths, and other facilities to support the temple as well as the beach. There are some prohibitions, so visitors are not allowed to enter such as: the visitor who is grieving due to the death of relatives and woman during their period. Visitors are also required to wear a cloth or a kamben. This is centuries-old temple but there is not much historical source or holy scripture about the temple. This temple is said to be linked to the journey of a holy priest, Dang Hyang Nirartha. The temple stands majestically, covered in scenic seascape and peaceful surroundings. The blue water, cool sea breeze, fragrant incense and offerings blend harmoniously, created a holy vibe and mystical atmosphere. Inside the temple there is a stone called "batu mejan" and has a relation with the worship procession. The stone has a philosophical and serve as a connection of people's prayer to heaven. Pujawali or temple anniversary is celebrated once a year on the "Purnama ke-5", the full moon of the fifth month according to Balinese Calendar. This temple becomes a destination for Balinese especially during the ceremony. They came wearing traditional costume, bring offerings and pray for salvation and harmony of the world.